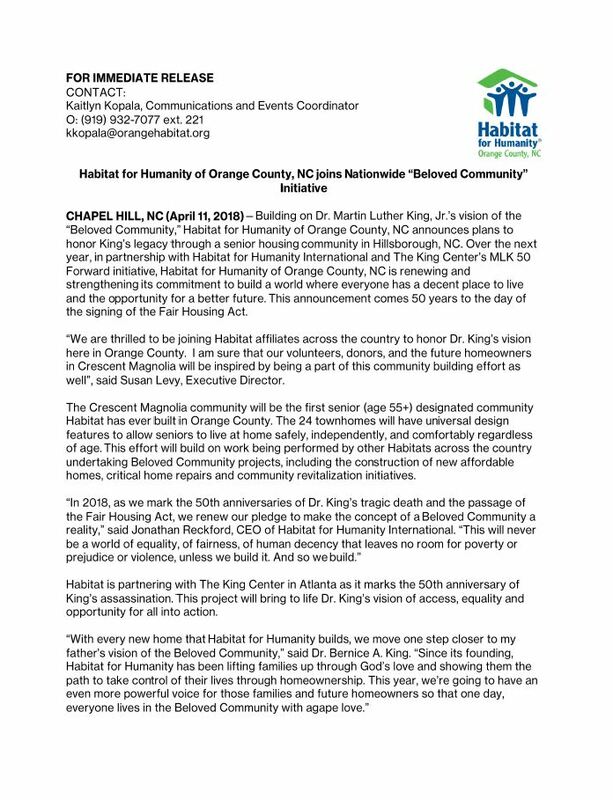 This year, Habitat for Humanity of Orange County, NC, along with other affiliates, is launching a special project to build the Beloved Community envisioned by Dr. Martin Luther King Jr. 2018 marks the 50th anniversary of his death and the passage of the Fair Housing Act. Building on Dr. King’s vision and history, the Beloved Community will allow access, equality, and opportunity for all. 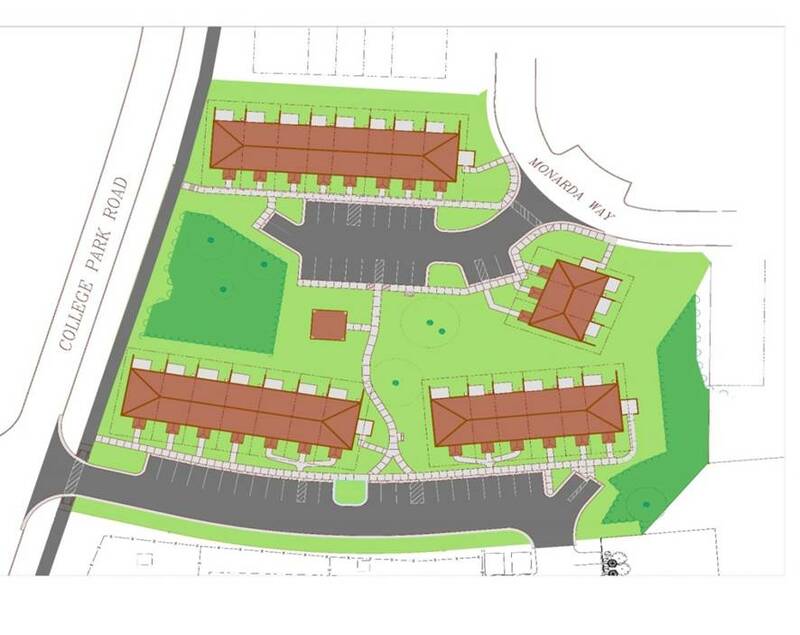 To honor his legacy, our new senior housing development, Crescent Magnolia, will be declared the Beloved Community. Habitat is inviting everyone throughout Orange County to participate and see the Beloved Community built in action. When searching for someone in Orange County who was vital to pursuing the Beloved Community throughout their career, Reverend Bob Seymour came to mind. 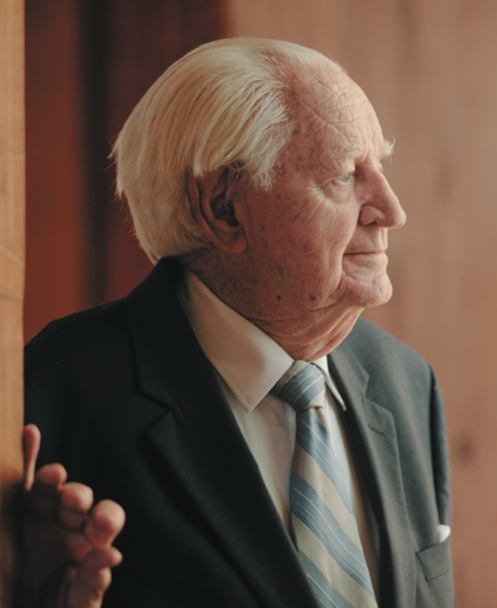 Reverend Seymour was the pillar who helped start the Orange County Habitat for Humanity affiliate back in 1984 through Binkley Baptist Church where he was the senior pastor for 30 years. He spent his life pursuing justice and fairness for families throughout Orange County, and was able to meet Dr. King during his time as a civil rights activist. At the age of 93, he continues to pursue fairness, equality, and respect for all people and is a strong leading voice in our community. We are honored to name the first building in our new senior housing development after Reverend Bob Seymour. 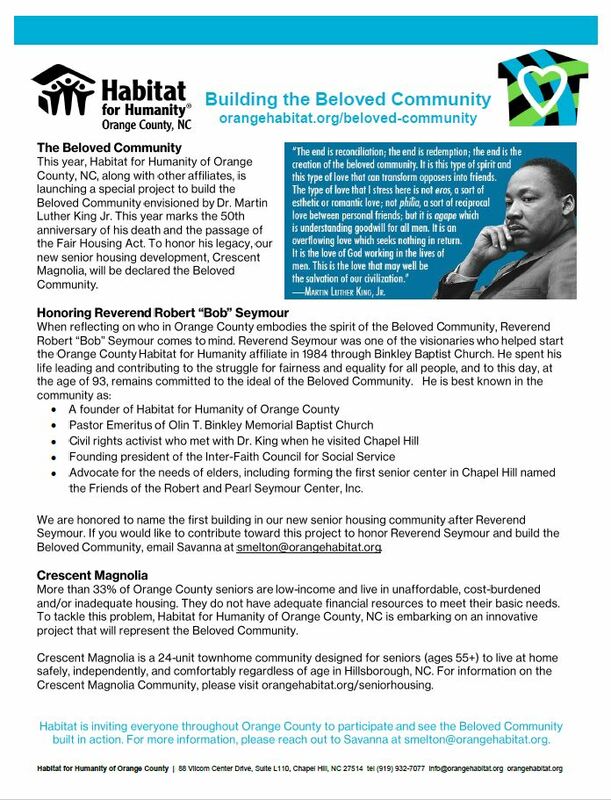 If you would like to contribute toward this project to honor Reverend Seymour and build the Beloved Community, email Jennifer at jplayer@orangehabitat.org. More than 33% of Orange County seniors are low-income and live in unaffordable, cost-burdened and/or inadequate housing. They do not have adequate financial resources to meet their basic needs. To tackle this problem, Habitat for Humanity of Orange County, NC is embarking on an innovative project that will represent the Beloved Community. Crescent Magnolia is a 24-unit townhome community designed for seniors (ages 55+) to live at home safely, independently, and comfortably regardless of age in Hillsborough, NC. For information on the Crescent Magnolia Community, please visit orangehabitat.org/seniorhousing. While in the early stages of planning and fundraising for this project, we are currently looking for passionate supporters who would like to learn more information, get involved in the future, and support the Beloved Community. To get involved and stay in touch, sign the Beloved Community Pledge to get updates about the project and how you can make an impact!